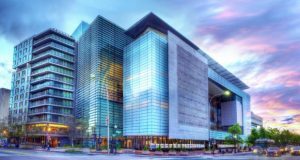 Johns Hopkins University plans to purchase the Newseum building in Washington to consolidate the university’s operations in the city. Hopkins will purchase the building on Pennsylvania Avenue from the Freedom Forum for $372.5 million, pending regulatory approval. The transaction was approved by the university’s trustees Thursday. The university will renovate the building to meet its needs, which include housing the some 3,300 students and faculty working and learning in Washington. That includes the School of Advanced International Studies, the business school, the School of Arts and Sciences and the School of Nursing. Renovating the museum will take considerable work and time, as it was built for that purpose. The university also hopes to use the building’s proximity to the Capitol to better inform decision-makers. Meanwhile, the Newseum will remain open through the end of the year, Freedom Forum, the museum’s creator and funder, said. The museum originally opened in 2008. Tim Curtis covers health care, higher education, and technology for The Daily Record.